While love was in the air all over the world this week, Tencent clearly isn’t feeling it toward all the Tel’Annas mains out there thanks to a still uncertified issue with her Valentine’s Day skin. To add insult to injury (assuming they were also a Tel’Annas main), a repeat offender was struck by the banhammer yesterday. To close things off, we have Valor Series times and match-ups for this week alongside last week’s results and news that international competition rule changes are set to crush the idea of “meta” picks. We hope you all had a good Valentine’s Day this year – or just a great day in general for those who think it’s little more than a marketing ploy. Arena of Valor saw two new Valentine’s Day skins this year – Jazz Lovers Elsu and Roxie – alongside the return of several popular ones from years gone by. 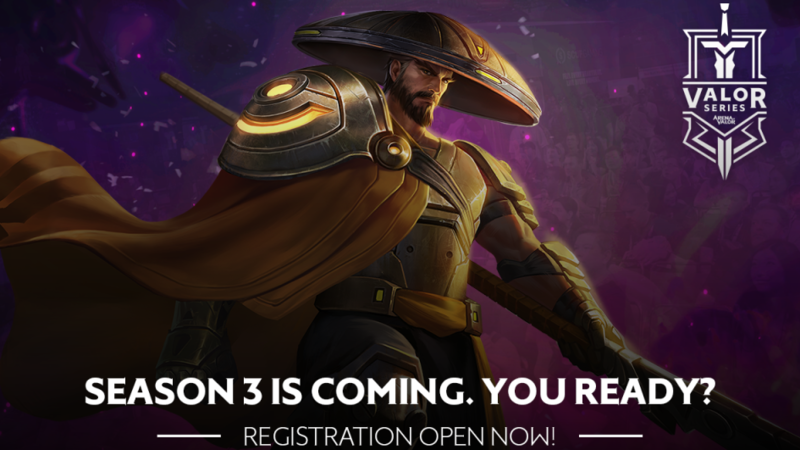 But while you’ll still be able to pick up both is this year’s signature skins for a few days yet, players are still struggling to obtain Tel’annas Love Sworn skin through due to a bug that Tencent only acknowledged long after it was reported by practically ever Tel’Annas player on the planet – and there’s a lot of them! The issue is present when trying to convert regular Skin Tokens to the Vow of Love tokens used to acquire the Love Sworn Tel’Annas skin. It’s clear this is the intended method, as skins are hand-picked to be exchangeable for Skin Tokens – not every skin appears on the list. The problem here is that no matter how many skin tokens you have on hand, the Convert button on this particular skin’s page doesn’t do anything. Players were able to earn around 6 Vow of Love tokens per day without conversion through the Valentine’s Day event, but with that officially done with today, it wasn’t around anywhere near long enough for players to earn the 120 tokens needed outright without converting some general skin tokens. After many days of reports, Tencent finally took notice of the problem by posting a notice on the in-game announcement board. But that was it. They didn’t offer a timeframe for a fix, or even whether a fix was even coming at all, really. But given the skin will probably disappear with the rest of them early next week, time is really running short. Another notice to hit the announcements page yesterday was that a player – or players – has received a 30-day ban for a rather vague problem relating to refunds. Arena of Valor customer support earned a reputation for being incredibly unforgiving when it came to refunds early in the game’s life, typically replying to requests with “there’s nothing we can do” no matter the circumstance for your refund request. I‘m not sure if things have loosened up a bit recently, but a swinging of the banhammer for successful refunds is an approach that would be justified if we knew or could understand the whole story. 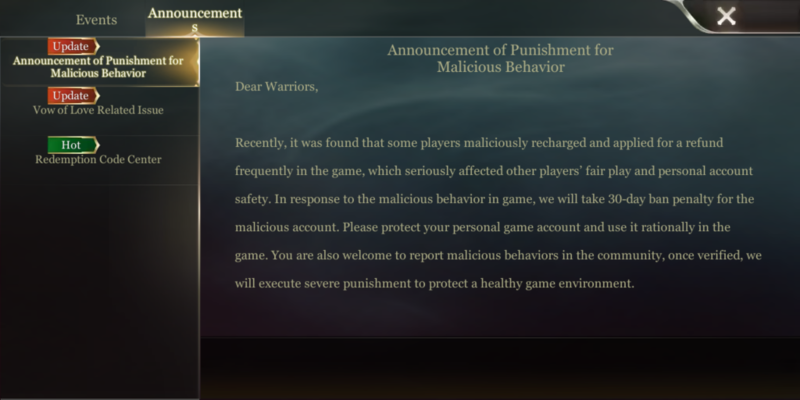 The notice published yesterday basically said that some accounts had frequently “maliciously recharged and applied for a refund”, resulting in Tencent dishing out the 30-day ban to protect “players’ fair play and personal account safety”. It almost sounds like they’ve banned someone who was abusing the last resort method of issuing a charge-back from their bank as a way to discourage the method to avoid truthful refund requests, like from fraud victims, from being scrutinized and potentially denied. But on the same note, they use the word “recharge” over charge-back, leading me to think they simply mean someone keeps buying (recharging) vouchers in-game and getting them refunded through customer support. The reason (and method) is unclear, but whatever went down, Tencent put a stop to it – for 30-days, at least. We’re headed straight to another weekend of regular Valor Series competition this weekend, and we’ve got the match times laid out for you down below. We’ve split times up to show when users in each region can watch each region’s matches. Last week saw a bunch of 2-0 finishes that seems all too reminiscent of past competitions. On Saturday, Nova EU beat Team Queso 2-0, GeOeSports delivered the same to Cream eSports, PrideStark broke YD Alpha and, in a more surprising turn of events, BMGaming beat down Dino Riders in the same fashion, with QLASH Spain doing the same against x6tence. On Sunday, x6tence lost again, this time in a demoralizing 0-2 set against Cream eSports. Sadly, their performance didn’t carry over to their next game as they lost 0-2 against ACE 1. Both Nova teams went 2-0 in their Sunday duels, leaving newcomers YD Alpha, Just4Fun, BMGaming, and Minority to go 1-1 against each other respectively. You can view last week’s standings and check out this week’s schedule on the Valor Series eSports website. Speaking of competitive Arena of Valor, the rules look set to change in this year’s international competitions. According to the Vietnamese Arena of Valor website, official tournaments taking place in the BO3 and BO5 format from February 23 will change from the usual ban/pick ruleset. Going forward, players will not be able to use and hero they used in previous rounds. And it isn’t even player-exclusive. In a BO7 match-up typically reserved from the closing matches of a tournament, the rule will to the first 6 rounds. As a sort of tie-breaker finale, round 7, should it come to that, will essentially wipe the slate clean and return to the original ban/pick ruelset. What this means it there’s going to be little consideration for the “meta” going forward. In lengthier sets,teams are going to have to practice with and make do with practically every hero in the game rather than relying on their few select mains.